17 states, primarily in the southeastern U.S., will hold a sales tax holiday in 2013, down from a peak of 19 states in 2010. While sales taxes are somewhat regressive, this is often exaggerated to sell the idea that sales tax holidays are an effective way of providing relief to the poor. To give a small amount of tax savings to low-income individuals, holidays give a large amount to others. Political gimmicks like sales tax holidays distract policymakers and taxpayers from genuine, permanent tax relief. If a state must offer a “holiday” from its tax system, it is a sign that the state’s tax system is uncompetitive. If policymakers want to save money for consumers, then they should cut the sales tax rate year-round. Sales tax holidays are periods of time when selected goods are exempted from state (and sometimes local) sales taxes. Such holidays have become an annual event in many states, with exemptions for such targeted products as back-to-school supplies, clothing, computers, hurricane preparedness supplies, products bearing the U.S. government’s Energy Star label, and even guns. High-tax New York State sparked the trend in 1997 as a way to discourage border shopping. 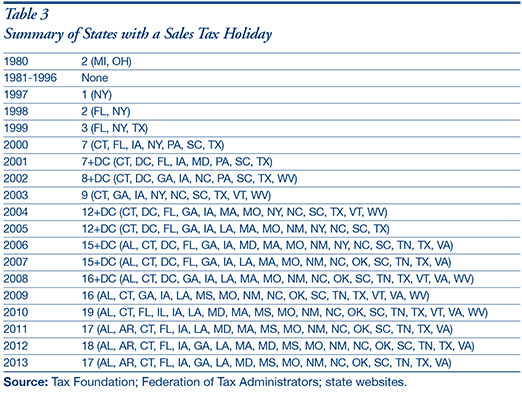 In 2013, 17 states will conduct sales tax holidays, down from a peak of 19 states in 2010 (see Table 1). While sales tax holidays are often defended on grounds of economic benefits, in reality a key motivation has been attempting to stop cross-border shopping, and perhaps even lure shoppers from other states. In 2005, Massachusetts adopted an extremely generous weekend sales tax holiday applying to all goods up to $2,500, attempting to stop Bay State residents from shopping in next-door New Hampshire, which has no sales tax. In 2009, Massachusetts temporarily abandoned the holiday as it raised its sales tax even further, from 5% to 6.25%. A number of states have tried sales tax holi-days and then cancelled them, a trend that has accelerated during the current recession and related state government revenue downturn. Florida and Maryland cancelled their holidays after 2007. Massachusetts cancelled its 2009 holiday after it hiked its sales tax, but reinstated it at the last minute in 2010, 2011, and 2012. In 2009, the District of Columbia, faced with declin-ing revenue and a widening budget shortfall, announced the one-year suspension of its August sales tax holiday only weeks before it was scheduled to occur, later repealing it per-manently. Meanwhile, Florida, having skipped in 2008 and 2009, returned to having a tax holiday starting in 2010. North Carolina in July 2013 approved legislation ending future sales tax holidays, using the revenue instead for broad-based tax relief. Other evidence suggests that sales tax holidays attracted cross-border sales only when other states did not have their own holidays, which is no longer the case. Peter Morici, an economist with the University of Maryland, told the Washington Examiner in 2006 that a sales tax holiday “has to be a novelty to be a measurable success and it’s no longer.” As the costs of squeezing a disproportionate number of sales into a short period of time have become clear, evidence suggests that fewer shoppers participate.9 For the vast majority of those who shop during sales tax holidays, the holiday simply provides a modest windfall, or unexpected benefit, for doing something they would have done anyway. In general, political efforts to manipulate the economy make markets less efficient by influencing consumers, retailers, and manufacturers to consume, sell, and produce more or less of a product than they otherwise would. While the economic costs of these distortions may be difficult to measure, they are real and economically damaging. Sales tax holidays usually only apply to a specific list of products, such as school supplies, sports equipment, clothing, or computers. 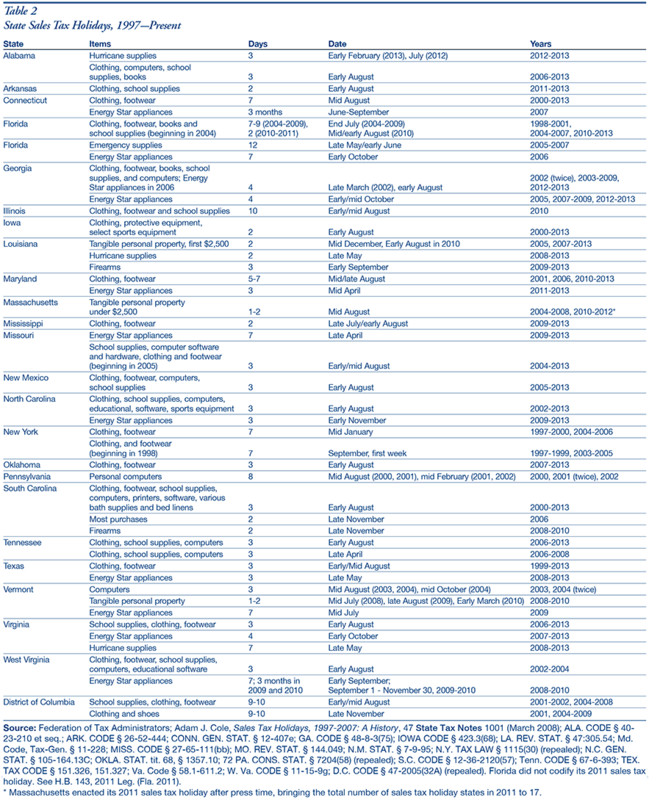 The number of categories has expanded in recent years to specific appliances, hurricane preparedness supplies, and even firearms. Restaurant owners in Massachusetts have even pushed for a prepared food sales tax holiday.12 These lists are a product of political forces. Politicians single out specific populations or industries and bestow targeted tax breaks on them. Such discrimination between products distorts consumer spending and reduces market efficiency by favoring certain products over others. Consumers should make consumption decisions for economic reasons, not tax reasons. Policymakers should not be convinced that a sales tax holiday is a good idea just because retailers support it. New York created its sales tax holiday for clothing in 1997 in response to retailer demands to address the state’s uncompetitive position in sales due to its high sales tax rate. Retailers pointed to high amounts of border shopping: New Yorkers traveling to shop in nearby states with lower sales taxes (in New York’s case, essentially every surrounding state). New York City Mayor Rudy Giuliani (R) proposed to exempt clothing up to $500 from the sales tax, but instead the state adopted a seven-day tax holiday. Two primary arguments were given in support of the holiday. First was the standard justification that the holiday would increase total sales and so provide a benefit to the overall economy. The second argument was that a sales tax holiday would reduce border shopping. New York lawmakers wanted residents to stay in-state to purchase clothing, and hoped that a sales tax holiday would bring the economic activity back to their state. The New York Department of Taxation and Finance study of its sales tax holiday found that while sales increased during the holiday, sales for the year were almost unchanged. Statewide, the increase in sales between the two comparable quarters was 2.9 percent. Nationally, retail sales of clothing and footwear in the first quarter of 1997 increased by 5.7 percent over the previous year. Shoppers did not purchase more goods overall, but rather shifted the timing of retail purchases to the tax-exempt period. The study found that increased consumer activity during the tax holiday was offset by reduced activity before and after. Without an increase in overall consumption there is no benefit to the overall economy. As for border shopping, this can be a significant problem for states. But a sales tax holiday only combats the border shopping problem for a short time before, during, and after the event. Lower-taxed neighboring states are available all year, as Delaware and New Hampshire proudly advertise to consumers. The New York report came to the same conclusion, saying that if New York legislators were concerned with reducing border shopping they should reduce the sales tax all year long. New York lawmakers accepted the report’s findings but developed a misguided policy response. New York now has a sales tax exemption for clothing and shoes costing under $110. This year-round “holiday” does not discriminate across time and reduces complexity, but still has politicians using the tax code to shape behavior and distort economic decisions. Excluding clothing greatly narrows the New York sales tax base, increasing volatility and driving other taxes upward to make up the revenue loss. New York missed an opportunity to broaden its sales tax base, lower its sales tax rate, increase revenue stability, and reduce economic distortions. Some sales tax holidays have a more specialized purpose. For instance, three states—Georgia, Virginia, and West Virginia—have sales tax holidays for energy-efficient appliances. In these cases, lawmakers justify the sales tax holiday by claiming that they are trying to stimulate the purchase of products that benefit society and have been overlooked by the public. But even if such tax policies do stimulate the desired consumption, they have the problem of providing a windfall to those consumers who put off their purchases until the holiday, while not benefitting those who already purchased the products. This can be considered unfair, and it would lead to individuals postponing their purchases, undermining the holiday’s very purpose of encouraging additional purchases! When evaluating the effectiveness of sales tax holidays, the proper question is not whether people will buy the targeted item during the holiday. Of course they will. Instead, policymakers must compare the revenue, administrative, and economic costs of the holiday while evaluating how consumers respond to price changes, how many items would have been sold regardless of a sales tax holiday, whether other taxes will go up or spending will be cut (and whether the spending cut is valuable or wasteful), and how much society benefits from additional purchases of the select items. For example, assume 100 people would have purchased energy-efficient appliances whether or not there is a sales tax holiday. (One can take a federal tax deduction for part of the purchase.) Now suppose a sales tax holiday occurs and five additional consumers purchase qualified appliances. As a result, businesses incur the costs of conducting the holiday and the government loses tax revenue on 105 sales and (assuming no other spending is cut) must make up the revenue elsewhere. Are the benefits for society from additional energy-efficient appliances worth these costs? It seems likely that for energy-efficient appliances and other cases, the social benefits are outweighed by the costs. There is little economic justification for why a product purchased during one time period should be tax exempt while the same product purchased in another time period should be taxable. If the purpose of sales tax holidays is to make school supplies and clothes cheaper for low-income individuals, then a 4 to 7 percent price reduction for all consumers, but only for a brief period, is an odd and ineffective way of achieving it. It’s an example of politicians using a fire hose when a garden hose will do a better job. In June 2008, the U.S. Supreme Court handed down its decision in Heller v. District of Columbia, upholding an individual right to bear arms as protected by the Second Amendment to the U.S. Constitution. Some state legislatures sought to use tax policy to reaffirm support for gun rights. This goal was apparently the motive behind South Carolina’s decision to hold a gun sales tax holiday for two days after Thanksgiving in November 2008. State Representative Michael Pitts (R), who sponsored the House bill, stated that the holiday “was politically designed to bring recognition to the importance of the Second Amendment.” The taxpayer savings were estimated to be minimal: just $15,000. The bill was put into law over the veto of then-Governor Mark Sanford (R), who wrote, “While we support the intent underlying sales tax holidays, we are vetoing this bill because we don’t believe that sales tax holidays are an effective method of promoting energy efficiency or the Second Amendment.” The South Carolina Policy Council also criticized the holiday: “This is a symptom of a problem we have; there will always be pet projects that individuals support. If we allow lawmakers to tinker with the tax code for everything they support at the expense of those they do not, we’ll end up with what we have now, which is an absurdly complicated tax code.” After a legal challenge and more legislative action, South Carolina held firearms sales tax holidays in 2008, 2009, and 2010. The media attention resulted in Louisiana enacting a similar “Second Amendment” tax holiday, to be held in early September 2009, and each year subsequently. A similar proposal in West Virginia was vetoed by Governor Joe Manchin (D) in April 2010. Gun sales tax holidays are perverse in that they suggest that our rights need governmental encouragement through the tax code to be meaningful. Giving tax credits to individuals who plead the Fifth Amendment or assemble to present grievances would be absurd. The fewer economic decisions that are made for tax reasons, the better. One unintended consequence of treating products non-neutrally in the tax system is that the South Carolina gun sales tax holiday did not apply to safety vests, gun safes, carrying cases and locks. The net result is that the government encouraged people to buy guns but not the associated safety equipment. Similarly, Louisiana’s hurricane preparedness holiday applies to candles, even though the state’s official hurricane preparedness guide warns people not to use candles because of the danger of gas leaks and fire. Sales tax holidays introduce these costly economic distortions into the economy. Buying products, including guns, is a personal decision best made in an efficient and non-distortionary market. If tax relief for consumers looks good for a few days, why not give it to them all year long? If policymakers genuinely want to save money for consumers, then they should cut the sales tax rate year-round. While the rate reduction may be modest, such a change would put the same money back in taxpayers’ hands without the distortions and complications associated with a sales tax holiday. For example, applying the revenue loss from a 2008 New Jersey tax holiday proposal could reduce the state’s sales tax rate from 7% to 6.6% year-round. If tax relief for consumers looks good for a few days, why not give it to them all year long? As scholars Hawkins and Mikesell put it, sales tax holidays are “a Soviet-style state-directed price reduction on items selected by the state…” If prices fall during sales tax holidays, the public can have the dangerous impression that government can control prices, something that should be anathema to conservatives and libertarians. In response, New Hampshire launched a $40,000 ad campaign emphasizing the number of days each state has with no sales tax (“New Hampshire: 365, Massachusetts: 2”). See Alicia Hansen, “New Hampshire’s 365-Day Sales Tax Holiday,” Tax Foundation Tax Policy Blog (Aug. 4, 2005), at www.taxfoundation.org/blog/new-hampshires-365-day-sales-tax-holiday. between 2000 and 2005 (Florida, Georgia, Illinois, and Indiana). For information on state gas tax holidays, see Jonathan Williams, “Paying at the Pump: Gasoline Taxes in America,” Tax Foundation Background Paper, No. 56 (Oct. 2007), at 14-16. See, e.g., Alabama Department of Revenue, “Local Governments That Have Notified the Department Regarding Participation,” available at www.ador.state.al.us/salestax/STholiday.htm (listing 59 localities that have opted out of the state sales tax holiday); Missouri Department of Revenue, “Back to School Sales Tax Holiday—Cities Opting Out,” at dor.mo.gov/tax/business/sales/taxholiday/school/cities.php (listing 172 cities that opted out of the state sales tax holiday); Larayne Brown, “Shoppers throng to state’s sales tax holiday,” Jackson Clarion-Ledger (Aug. 1, 2009) (“Kathy Waterbury, spokeswoman for the [Mississippi] State Tax Commission, has gotten reports that some retailers weren’t participating in the event.”). However, in most states with sales tax holidays, retailer participation is not optional. John L. Mikesell, “State Sales Tax Holidays: The Continuing Triumph Of Politics Over Policy,” 2006 State Tax Notes 107, 112 (Jul. 10, 2006). Adam J. Cole, “Christmas in August: Prices and Quantities During Sales Tax Holidays,” May 2009, at 23. In a separate paper, Cole suggests the shifts are short-term ones, finding “no evidence that purchases are shifted across months to exploit the tax holiday in sufficient amounts to impact tax collections in months preceding or succeeding the month of a tax holiday.” Adam J. Cole, “The Fiscal Impact of Sales Tax Holidays,” May 2009, at 3. See, e.g., Jenny Kincaid Boone, “Virginia’s sales tax holiday: just the icing on the cake,” Roanoke Times (Aug. 5, 2009) (“Larie Thompson…decided to get a head start on the sales tax holiday. She took her two daughters to the Bonsack Wal-Mart to scout out school deals, but she planned to wait until the tax-free weekend to buy them.”); Emilie Bahr, “New Orleans merchants hope sales tax holiday brings boost,” New Orleans Citybusiness (Aug. 3, 2009) (“At The Garden Gate on Old Metairie Road, for example, manager Sara Draper said some customers will select a fancy fountain or bench but wait to swipe their credit cards until they can get the item during the tax-exemption period.”); Louis Llovio, “Sales-tax holiday on school supplies starts Friday,” Richmond Times-Dispatch (Aug. 2, 2009) (“Diane Parnell, who was shopping with Reason at the Target on Midlothian Turnpike last week, said she will do some shopping before the tax holiday begins, but will wait until the weekend to buy most of the supplies on her children’s list.”); LaTina Emerson, “Georgia’s sales tax holiday starts Thursday,” Augusta Chronicle (Jul, 29, 2009) (“Robyn Linen of Grovetown was shopping at Target…. She usually waits until the holiday so she can save money, she said.”); Emma Brown, “Shoppers go for the gold on tax holiday,” Boston Globe (Aug. 17, 2008) (“‘We’re going to come back again tomorrow’ for a stove, said Mariam Haddad of Somerville, who waited until this weekend to buy a crib for her day-care business and a digital camera for her 14-year-old daughter.”). The Tax Foundation has also received calls from individuals asking about the likelihood of their state conducting a sales tax holiday, with the caller’s intent being to postpone purchases if a holiday occurs. See, e.g., Josh Barro, “Even Proposing a Sales Tax Holiday Creates Instability,” Tax Foundation Tax Policy Blog (Oct. 21, 2008), at www.taxfoundation.org/blog/even-proposing-sales-tax-holiday-creates-tax-instability. Dena Levitz, “Sales tax holiday returns to Maryland,” Washington Examiner (Aug. 23, 2006). See, e.g., Mary Worrell, “Sales tax holiday a bust for some retailers,” Hampton Roads Business Journal (Aug. 13, 2007) (“Zenisek spent money advertising the tax-free weekend in area publications and had more employees in-store anticipating an influx of traffic, which she never saw.”); Mark Albright, “Sales tax holiday’s appeal may be slipping,” Tampa Bay Times (Aug. 2, 2007) (“‘I’m done,’ proclaimed the Largo nurse and mother of three during a recent outing at Target, ‘I shop the sales year round for real deals. I’m trying to be more practical. I won’t be fighting crowds for the small savings during the sales tax holiday.’”); Jenny Munro, “Budget-conscious shoppers welcome sales tax holiday,” Greeneville News (Aug. 5, 2009) (“Mel Lester, who was shopping for summer shorts for her two children, said she probably wouldn’t shop on the sales tax holiday weekend. ‘You don’t save enough to make it worth fighting the crowds,’ she said.”); Christel Phillips, “Many East Texans not waiting for tax free weekend to shop,” KTRE (Lufkin, TX) (“‘Parents tend to do it two weeks in advance,’ said Maria Hernandez, a JC Penny store manager. She says many parents don’t want to take a risk when school is just around the corner…. Some store managers recommend shopping before the tax free weekend to avoid missing out on items that could be out of stock.”). 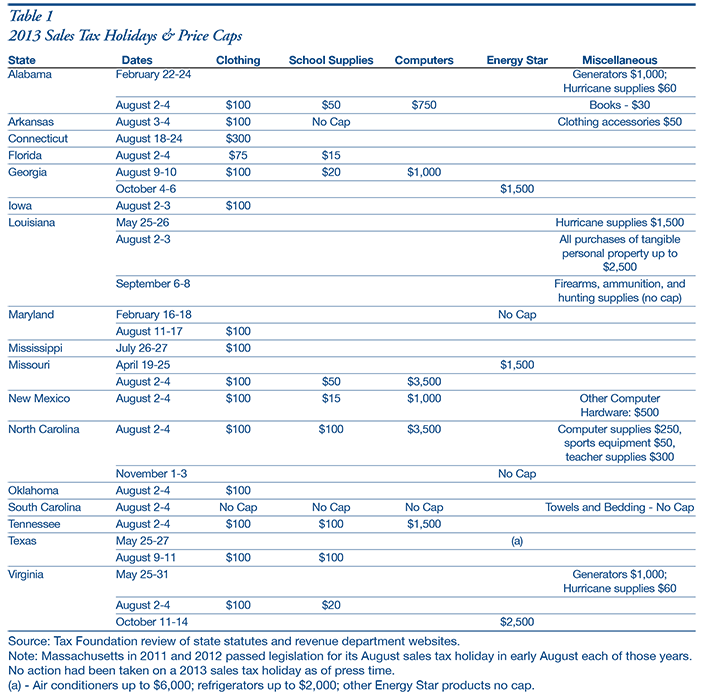 See, e.g., Micah Cohen, “A True Cause for Celebration: DC Cancels Sales Tax Holiday,” Tax Foundation Tax Policy Blog (Jul. 22, 2009), at www.taxfoundation.org/blog/true-cause-celebration-dc-cancels-sales-tax-holiday. See Kendall Hatch, “Restaurants Seek Their Own Tax Holiday,” Taunton Gazette (Feb. 7, 2011); S.B. 1528, 2011 Leg. (Mass. 2011). See, e.g., Mark Robyn, “Border Zone Cigarette Taxation: Arkansas’s Novel Solution to the Border Shopping Problem,” Tax Foundation Fiscal Fact No. 168 (Apr. 2009), at www.taxfoundation.org/publications/show/24599.html. See, e.g., Josh Barro, “New York Governor David Paterson’s Tax and Fee Proposals a Mixed Bag,” Tax Foundation Fiscal Fact No. 159 (Jan. 2009), at www.taxfoundation.org/research/show/24230.html (noting that the New York clothing exemption will cost $462 million in FY 2009-10 and $660 million in FY 2010-11). The exemption was enacted in 1999, repealed in 2003 with tax holidays offered instead, and then re-enacted in 2006. New York City exempted all clothing of any price from its local sales tax from 2005 until August 1, 2009, when it adopted the state’s price cap. In December 2008, as interest groups of all kinds sought a piece of federal stimulus proposals under consideration, a group of large retailers pushed Congress to adopt three nationwide sales tax holidays for 2009. See, e.g., Ann Zimmerman, “Retailers Want In on Stimulus Plan,” Wall Street Journal (Dec. 24, 2008). The group stated its proposal would be stimulative, and pointed to a survey that 82% of consumers favored a sales tax holiday and that 69% said they would make purchases they otherwise wouldn’t make. That consumers support receiving benefits when no costs are explained to them shouldn’t be surprising. The economic evidence from various studies provided in this report undermines the idea that many additional purchases would occur, especially in a recession. See Richard Harper, et al., “Price Effects Around a Sales Tax Holiday: An Exploratory Study,” Public Budgeting & Finance 23 (Winter 2003): pp. 108-113. The University of Florida researchers noted that prices also rose in nearby Mobile, Alabama, suggesting that some of the price increase occurred for reasons other than the sales tax holiday. Cole found in his study of computer prices during sales tax holidays that the holiday induced retailers to raise prices of inexpensive laptop computers but lower prices of inexpensive desktop computers. See Adam J. Cole, supra, “Christmas in August.” Additionally, scholars Richard Hawkins and John Mikesell note that retailers’ ability to raise prices are more constrained during recessions. See Hawkins and Mikesell, supra, 2001 State Tax Notes 45-56. Further research analyzing price effects before and during sales tax holidays would be valuable. See, e.g., Michael Handy, “Sales tax holiday not all it’s cracked up to be,” WBTV (Charlotte, NC) (Aug. 3, 2009) (“If you looked at the fine print in Sunday’s newspaper advertisements, you may have noticed some of the best sale prices will end several days before tax-free weekend. In fact, JC Penney started a huge sale on Sunday which ends Tuesday. For example, Levi Jeans are marked down to $32.99 which is $11 cheaper than the normal price. If you wait for the sales tax holiday, you will pay the full price of $44 and save only $3 in taxes. Belk is also offering some of its best prices from now until Tuesday, including an extra 15 percent off all home purchases. Remember, you will save only seven percent if you wait for tax-free weekend. Some retailers are honoring their discounts for at least part of the sales tax holiday. Office Depot, Best Buy, Target and Sports Authority are running their biggest sales from now through Saturday. In these cases, you are better off waiting until the weekend.”). See also David Brunori, “The Politics of State Taxation: Welcome to the Club?” 2001 State Tax Notes 265 (Jan 22, 2001) (“I talked to several retailers in New York, who said they raised prices considerably knowing that people thought they were saving money by shopping tax-free.”). See, e.g., Mary Worrell, “Sales tax holiday a bust for some retailers,” Hampton Roads Business Journal (Aug. 13, 2007) (“Corprew said larger corporations and department stores have the luxury of big computer systems to calculate tax-free items, but for a small business like her clothing shops, she and her partner spend hours photocopying receipts and organizing sales information just to make sure everything is accurate and in order. ‘We have to split all the details and it’s a tremendous amount of work for us,’ Corprew said.”). See Mississippi State Tax Commission, “Official Guide For 2009 Sales Tax Holiday,” at www.mstc.state.ms.us/taxareas/sales/06-03-09SalesTaxHolidayGuide.pdf. See Virginia Department of Taxation, “Sales Tax Holiday for Clothing and School Supplies Guidelines and Rules,” at www.tax.virginia.gov/Documents/School%20Supplies%20and%20Clothing%20Sales%20Tax%20Holiday%20Guidelines.pdf. See Texas Comptroller of Public Accounts, “Energy Star Sales Tax Holiday,” at www.window.state.tx.us/taxinfo/taxpubs/tx96_1331. Vermont Department of Taxes, “Temporary Exemption for Computers August 7-9 and October 9-11, 2004,” at tax.vermont.gov/pdf.word.excel/legal/tb/TB30.pdf. 72 Pa. Const. Stat. § 7204(58) (repealed). See, e.g., Pat Hatfield, “The mystery of Florida’s vanishing sales tax holiday,” The Deland-Deltona Beacon (Jul. 8, 2008). An exception would be where there is a negative externality, or societal cost, caused by consumers postponing their purchase. For instance, if an epidemic were raging and vaccines were available but too costly, immediately suspending governmental costs on vaccine purchases could encourage people to move up their vaccination, benefitting all society. In most such cases, however, other policy solutions such as subsidies or outright government provision would be more effective than a tax holiday. See Richard R. Hawkins and John L. Mikesell, Six Reasons to Hate Your Sales Tax Holiday, 2001 State Tax Notes 45-56 (Mar. 7, 2001). Sarita Chourey, “Critics say sales tax holiday makes code too complicated,” Augusta Chronicle (Nov. 23, 2008). See Joseph Henchman, “South Carolina Prepares for Gun Sales Tax Holiday,” Tax Foundation Tax Policy Blog (Nov. 26, 2008), at www.taxfoundation.org/blog/south-carolina-prepares-gun-sales-tax-holiday. See American Petroleum Institute v. South Carolina Dept. of Revenue, 677 S.E.2d 16 (S.C. 2009). 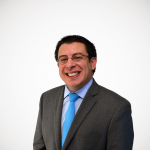 See Joseph Henchman, “Louisiana Tax Credits: Politicians Picking Winners and Losers,” Tax Foundation Tax Policy Blog (Jul. 11, 2009), at www.taxfoundation.org/blog/louisiana-tax-credits-politicians-picking-winners-and-losers. See Mannix Porterfield, “Manchin guns down NRA-backed bills,” Beckley Register-Herald (Apr. 3, 2010). Louisiana Office of Homeland Security & Emergency Preparedness, “Before & After a Hurricane Fact Sheet,” at www.ohsep.louisiana.gov/factsheets/todohurrsht.htm (“Don’t light candles.”). See, e.g., Josh Barro, “New Jersey Republicans Propose Sales Tax Holiday,” Tax Foundation Tax Policy Blog (Oct. 14, 2008), at www.taxfoundation.org/blog/new-jersey-republicans-propose-sales-tax-holiday. See Hawkins and Mikesell, supra, 2001 State Tax Notes 45-56. Jonathan Williams, “Holiday Season ‘Tax Holidays’ No Break for Taxpayers,” Myrtle Beach Sun News (Nov. 23, 2006), available at www.taxfoundation.org/research/show/2017.html.